It’s Monday already and darn, the weekend has flown by! It was a time to relax and enjoy family life. Today, it is back to the grindstone of life, though, reading your Tarot cards is not an arduous task or one I shall ever complain about! I love doing what I do and for today, I share the Three of Vessels, with the key word of “Joy”. As you can see from the image of the cards, the three cranes dance and flap about three cups that are all different. 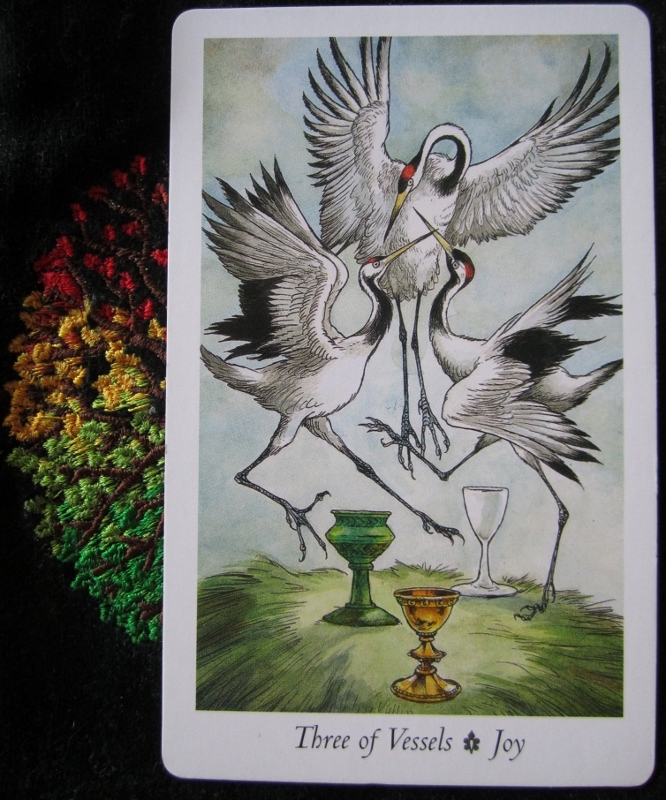 The things that they have in common are that they’re all cranes and that they all have cups, even though the vessels are all different colours and may contain different liquids: it matters not. So the question today, despite it being a Monday, are simple: What joy can you find in today? Are you glad to see this Monday? What kind of weekend have you had? Was it a good one, or are you glad to see the back of it? I am not glad to see the back of it, though I am grateful to be this side of it, still alive, breathing and those that I love and care for deeply are also in the same: alive and breathing. But I know this: today two little boys will be dancing like these cranes as they count down to something all children enjoy: A party! We’re on the way to Beltane, which makes me happy as summer is finally on its way, properly! Enjoy your party and if you were not planning one, who says you can’t have one on a Monday evening? Just, don’t stay up too late! I’m here when you need me!